The Horror Digest: This is Why I Don't Talk to People on the Train. This is one of my favorite Hitchcock films. Based on the book by Patricia Highsmith who also wrote "The Talented Mr. Ripley" another great book AND movie which I think is rare to have both. 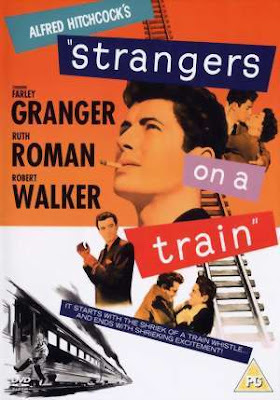 Strangers on a Train is the classic tale of that friend who just won't leave you alone. And that friend who is a murdering psychopath. We all have them don't lie. Guy Haines a famous tennis player is trying to divorce his wife Miriam. On the way to meet with her lawyer he meets a man on the train named Charles Anthony Bruno. The man seems like a nut job, and pries a little too much into Guy's life. After a few drinks Chaz suggests they make a swap. He'll kill Miriam for Guy if Guy kills his father for him. Guy thinks Chaz is merely making a joke and laughs it off as he gets off the train, saying yes yes Bruno whatever you say good plan. Bruno meets up with Miriam at a fair where he stalks her, finally strangling her on an island. Bruno meets with Guy and tells him he's done his part and hands Guy Miriam's broken glasses. Guy flips out at him and rushes home. Bruno now starts following Guy every chance he can get, becoming friends with people he knows, slipping him maps of his house and sending him a revolver to kill his father with. It's all very stressful and Bruno is such a whack job. The beauty of Hitchcock films for me are those amazing shots we get. There's the picture of Bruno after he strangles Miriam reflected in her glasses, the juxtaposed women with glasses, the scene at the tennis match where everyones heads are following the balls back and forth except Bruno who stares straight ahead at Guy amidst the sea of turning heads. Bruno is really frustrating in this, which makes him an excellent villain and character. My other favorite character is Babs hah I love her. The end scene is also really really great and maybe a tad comical. But there are really some great moments in this one, especially when Bruno is tailing Miriam at the fair sooooo creepy. So if you are interested in Hitchcock but haven't seen many, definitely see this one it can't be missed. Here is the creepy part where Bruno stalks Miriam at the fair.